Carter Holton had never played on this big of a high school stage before. By the time the freshman was finished, he might as well owned it. 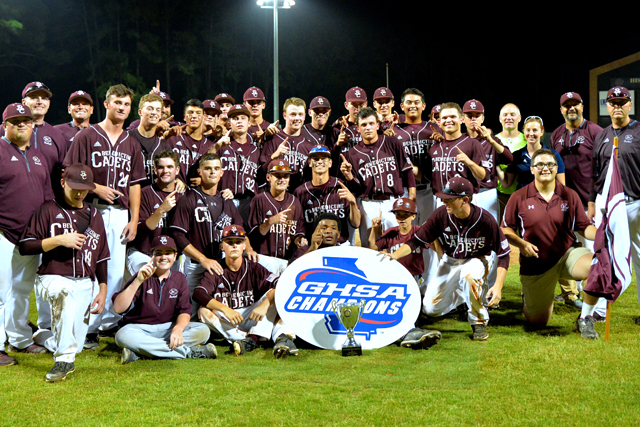 Holton went the distance in Game 2 of the Georgia High School Association Class 2A state championship, allowing just one hit and striking out 10 as Benedictine won its first state baseball championship since 2014 with a sweep of Berrien Monday night at Grayson Stadium in Savannah. The Cadets rallied for a 6-3 victory in Game 1. Holton went 2 for 3 at the plate and his RBI single keyed a three-run fifth inning in Game 2 to give the Cadets (31-7) all the run support they needed. Garrison Gunby also had an RBI single in the inning, while Jacob Marliton's sacrifice fly accounted for all of Benedictine's runs. Ryan Pickard also went 2 for 3 at the plate to lead the Cadets. Rhett Thomason had the only hit off Holton in Game 2. Benedictine's momentum from Game 1 carried over into the second game of the series. Berrien (27-15) took a 2-0 lead in the third inning of Game 1 on an RBI single from Justin Roberts and an RBI double from Darius Tisby. The Rebels then made it 3-0 in the fourth on an RBI double from Tanner Adams. But Benedictine tied the game in the fifth on a sacrifice fly by Holton, then John Thorpe's triple plated two runs. The Cadets grabbed the lead with three more in the sixth on Johnny Richardson's single that scored two runs. Markiton added an insurance run with an RBI double. Gunby earned the victory on the mound in Game 1, going six and a third innings before Holton worked the final two outs to notch the save. Markiton and Thorpe each finished 2 for 4 to lead the offense. Berrien was playing in the state championship season for the first time since winning the Class 2A title in 1988. That team went undefeated.